Some countries opt for a split captaincy, with different captains for different formats to manage workload. Shakib Al Hasan (left) captains Bangladesh in Tests and T20Is, and Mashrafe Mortaza (right) leads the team in ODIs. 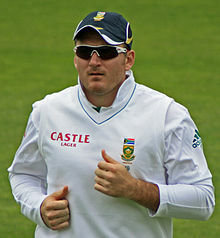 The captain of a cricket team, often referred to as the skipper, is the appointed leader, having several additional roles and responsibilities over and above those of the other players. As in other sports, the captain is usually experienced and has good communication skills, and is likely to be one of the most regular members of the team, as the captain often has a say in team selection. Before the game the captains toss for innings. During the match the captain decides the team's batting order, who will bowl each over, and where each fielder will be positioned. While the captain has the final say, decisions are often collaborative. A captain's knowledge of the complexities of cricket strategy and tactics, and shrewdness in the field, may contribute significantly to the team's success. The decision also depends on the relative strengths of the team's batting and bowling. For instance in Test cricket, a side with only fast bowlers may choose to bowl first to try to take advantage of any early moisture in the pitch, knowing that it will be harder to take wickets later in the match. Similarly a side with a weak opening batting pair may choose to bowl first in order to protect their batsmen. The captain decides where the fielders will stand, in consultation with the bowler and sometimes other senior players. The fielding positions will usually be dictated by the type of bowler, the batsman's batting style, and the captain's assessment of the state of the match (and hence whether to set an attacking or a defensive field). When the team bats, the captain decides the batting order. In professional cricket the captain usually changes the established batting order only for exceptional reasons, because batsmen tend to specialise in batting at certain positions. However, in certain circumstances it may be in the team's interest to change the batting order. If quick runs are needed, a naturally attacking batsman may be promoted up the order. A player who is 'in form' may be promoted to a higher batting position, at the expense of a player who is 'out of form'. If a wicket falls near the end of a day's play, especially if the light is failing, or if the bowlers seem particularly confident, the captain may choose to send in a non-specialist batsman, referred to as a nightwatchman. If the nightwatchman does not get out before the end of that day's play then the specialist batsman will have been protected, and will not need to bat until the following day when conditions are likely to have improved. If the nightwatchman does get out, the cost of losing a late wicket will have been minimised, because the specialist batsman is still available to bat. As well as decisions taken either immediately before or during a match, captains also often have some responsibility for the good running of the cricket club. For instance, they may decide when the team is to practise, and for how long. 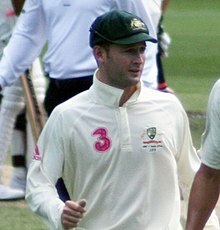 In professional cricket the captain often has some say in who will form the squad from which teams are selected, and may also decide how young up-and-coming players are to be encouraged and improved, and how members of the squad who are not regularly selected for first-team matches are to gain match practice. Prior to July 2015, the captain was responsible for deciding when to take batting and bowling powerplays in limited overs matches. The captain may be assisted by a vice-captain or in some instances joint vice-captains. This is particularly useful if the captain is forced to leave the field of play during fielding. Some teams also allocate the vice-captain a more or less formal role in assisting with team selection, discipline, field-setting and so on. Sometimes the role of vice-captain is seen as preparation for the player(s) becoming the captain of the side in future. ^ "Records / Test matches / Individual records (captains, players, umpires) / Most matches as captain". ESPNcricinfo. Retrieved 18 January 2016. ^ a b c d e f g h i j k "The Role of the Captain". DangerMouse. Retrieved 31 January 2015. ^ Gollapudi, Nagraj (26 June 2015). "Bowlers benefit from ODI rule changes". ESPNcricinfo. Retrieved 7 February 2015. ^ Brettig, Daniel (8 August 2015). "Clarke announces retirement after Ashes". ESPNcricinfo. Retrieved 20 January 2016. ^ "Enfield Cricket Club – Captains & Player Responsibilities". Enfield Cricket Club. Archived from the original on 1 February 2015. Retrieved 31 January 2015. ^ "Asghar Afghan removed as Afghanistan captain". Cricbuzz. Retrieved 5 April 2019. ^ "Australia announce new vice-captains". cricket.com.au. Retrieved 28 March 2019. ^ "Aaron Finch replaces Tim Paine as Australia ODI captain". www.icc-cricket.com. Retrieved 28 March 2019. ^ Martin, Ali (31 July 2018). "Jos Buttler's star continues to rise with promotion to Test vice-captaincy". The Guardian. ISSN 0261-3077. Retrieved 28 March 2019. ^ "Hamilton Masakadza to lead Zimbabwe in all three formats through 2019-20". ESPNcricinfo. 19 February 2019. Retrieved 28 March 2019.